This isn’t the 340g sourdough baguette I bought today, they’re some fresh egg noodles from Ranch 99 Market. It was my first time shopping at the asian foods store, and I found a lot of items far fresher and cheaper than anywhere else. 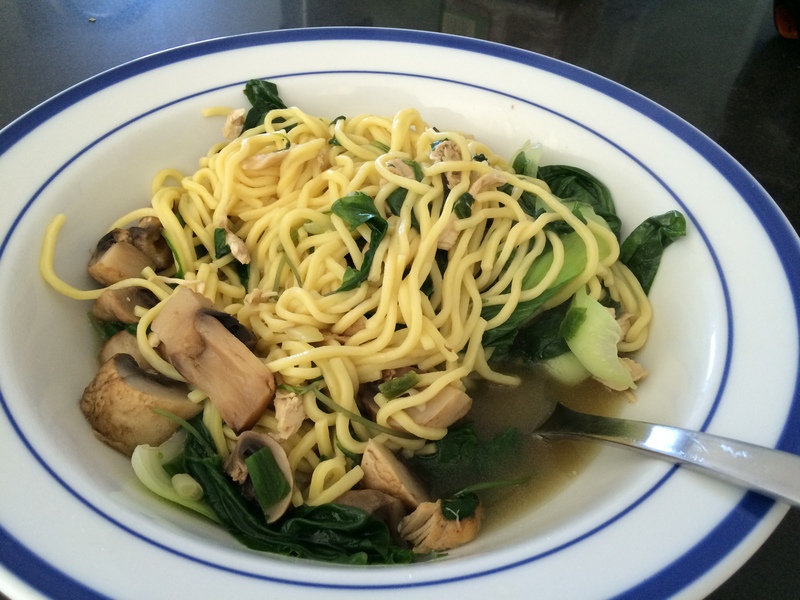 This was the best noodle soup I’ve made so far, using with fresh noodles, leftover roast chicken, mushrooms, spinach, baby bok choy, cilantro, green onions, sesame oil, and a ramen soup mix package. Needless to say, I’ve been eating plenty of additional “carbs” outside my daily pound of bread during this Challenge. They’re just calories, and when you balance them with fresh vegetables and other healthy nutrient-rich, high-fiber foods, you’ll fill up and lose weight. Do you think I’m just lucky and have a special metabolism that can “tolerate carbs”? Then do you think the US population as a whole would get even fatter eating like I do? Or do you think they’d lose weight overall? Telling everyone that “carbs make you fat” hasn’t worked over the last 15 years. But no accurate or reasonable nutrition advice would help the public either. People are going to eat the fat, sugar, and salt that the food industry makes for them. It’s human nature. Do I think you are lucky or favored by a great metabolism to be able to eat bread/carbs (noodles)? That depends. Some things gleaned from your blog are you are young and male. Duh! That helps with the metabolism stuff. Also, you cycle almost everywhere and ride with a social riding group. That’s a lot of calories burned! Cycling is great for that and as long as you enjoy it, keep it up. Living in San Diego with such great weather is one of life’s blessings! I like that you add so many veggies into what you do, the cruciferous kind especially. Your food pics look scrumptious and you do most of your own cooking and meal prep from these fresh ingredients which is another plus to your health. Ordering from a clown head day in and day out opens a body up to bad junk literally. Your lifestyle and habits set you up for good health and a healthy metabolism. So yeah, you are a lucky dog, but you are also making your own luck by buying fresh, cooking for yourself and making good choices when eating out. You are exploiting your environment both for food and exercise to aid yourself. This is a good thing. Thanks Cathy, you’re seeing things pretty clearly. I am very lucky to be living here in beautiful downtown San Diego. I’ve discovered a social circle here based around something I love (cycling), and it’s changed my life. I’d probably still be lying on the couch if I lived somewhere else. Men can definitely burn more calories, and eat more food than women. So, don’t get the idea that I think it’s a great idea to eat a pound of bread a day. I’m just trying it out, to see what happens. When I started this blog, I wasn’t sure about how much starch I could eat every day and still lose weight. I just trusted Dr. John McDougall, who explains that we stay thin eating our traditional starch-based diets. I started off being scared of massive amounts of carbs. But it’s really all about the veggies!